Just looking...that "suicide car" has only been lightly grilled. Our intrepid photographer on the ground, Evan Hill also fails to mention any car bomb in tweets.. The katiba was the site of Benghazi's fiercest battle; multi-day conflict. Civilians with homemade bombs vs. soldiers with machine guns. Working on article about katiba battle tonight; also took tons of pics of burnt out security HQs, with confidential files strewn all over. This procession, however, contained a surprise. As it approached the barracks, a 49-year-old named Mahdi Ziu peeled out from behind with a car rigged with four propane tanks and filled with makeshift explosives. "At one of two military bases at Shahhat near Bayda, a Libyan army officer said an effort as being made to gather all the available weapons in the base and on the streets to use to defend areas under rebel control. "The army units visible in the area did not inspire confidence and the main Shahhat base was the site of the climactic battle between rebel and government forces just a week before. The buildings were largely gutted and covered in graffiti. Spent shell casings littered the area, and burned and twisted heavy guns were everywhere. No mention of Katiba, yet he had written about it three days earlier. You're right about the car, and I need to work that in. I doubt that's the car in question, just one of the many found burnt. I doubt the friend's story of pulling out and recognizing his friend's body, at the very least. Just look at the bomb damage! There would be parts of a car, and scraps of charred flesh. Nothing to pull anything out of, nothing to recognize. Not that I'm an expert. Was there ever a car? Likely ... a rocket launcher won't do that. All I can think of is a good car bomb, or dropped bomb. Makeshift? Perhaps, but it lacked no punch. And it's true that this historic event is onlysporadically mentioned. It's not coveredup, but not headlined either, despite being so important. No protester videos I've seen of the procession, the car, the explosion, or the aftermath. The last, maybe I'm wrong and there is, but even a lack of footage of that important damage is odd - who was telling people what to share and not, and making sure they did so? Dead "mercenaries" okay. Heroic suicide bomber's work that "saved the revolution," too militant? 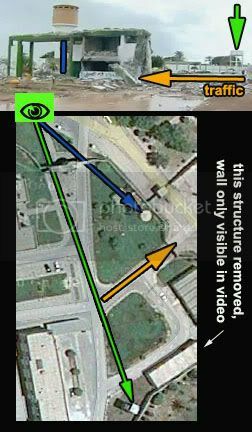 As for other attacks there, Goheda's video shows the bulldozer attack, on Feb 18 IIRC, confiscated from some company working nearby. 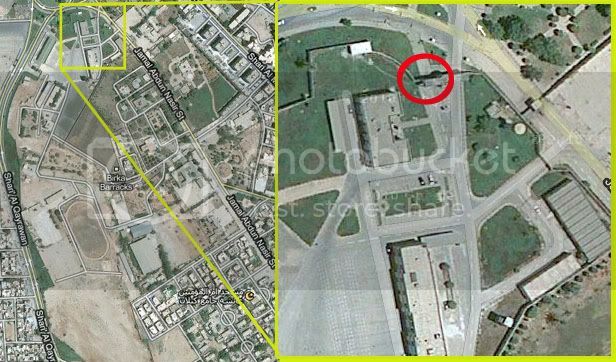 And I hear a tank was used, perhaps same day, taken from a base on the outskirts of Benghazi (a defector, I think).. Apparently it came with no shells, was just driven through the wall. He's also known as Shaheed Mehdi Ziu. There is also footage of the leader of the protests in London outside the US Embassy on February 23, Mr Naji El-Fallah, ناجى الفلاح who appeared in the Al Jazeera Video Libya @ a State of Terror , seen from about 4.17 onwards. At about 16.47 in the Benghazi Uprising video "Libyan activist" Khalid Mohamed talks about the Khatiba. (see 17.46 to 18.01-18.14 especially regarding the death of a boy said to be the son of Tariq Shamsa, Abdul Hafeedh عبد الحفيظ. What caused the injuries? The name appears on 1000 Libyans Libya remembers as عبد الحفيظ طارق شينفى Abdulhafeeth Tariq Shinfa , no date of death recorded. I can find no YouTube reference to Abdulhafeedh Shinfa or variations, english or arabic. Very odd for a martyr. The guards opened fire, but too late. The speeding car struck the gate and exploded, sending up a fireball that was captured on a cellphone video by a protester a few hundred yards away. The blast blew a hole in the wall, killing a number of guards and sending the rest retreating into the Katiba. Within hours, it would fall to the protesters. Is that a video he saw? I can't find it,easily anyway. Would like to see the nature of the explosion if possible. Will report back if I find it. And while we are on it....see this piece on Howstoffworks? called CNN Oddly Celebrates Hero Libyan Suicide Bomber by Josh Clark, 25 March 2011. Leela Jacinto of France24 also reported from Benghazion Mr Ziu on 28 April 2011: Gaddafi's gutted edifice of power draws gaping crowds, where she tracked down Ziu's younger brother,Salem (otherwise Salim). “The car was still smoking from 1pm the previous day, it was such a massive explosion. We went to pick up his body, but there was no body. No body,” repeats a visibly moved Salem, rubbing his furrowed brow in an attempt to compose himself. “It was all gone, it was all burned. There was no flesh, there were only bones. We gathered the bones and put them in a plastic bag and the bag weighed just around a kilo,” he notes. The earliest western reference to Ziu I find on NPR, 28 February 2011,:Libya's Rebellion Spawns A Trio Of Unlikely Heroes Lourdes Garcia-Navarro reporting. Mohammed Abdelhafif was one of his closest friends. He says Ziu joined the protests in Benghazi as soon as they happened, but he became furious and saddened by the bloodshed. 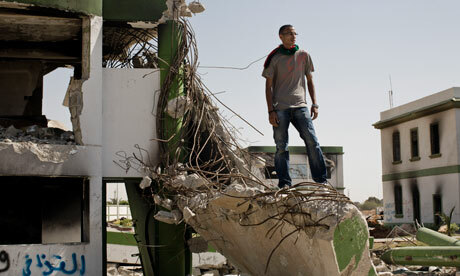 Many of the pro-Gadhafi forces were holed up around the main military base in the city; they used their guns to mow down protesters, witnesses said. The demonstrators were having no luck breaking into the heavily defended compound. Ziu's wife says he would come home with his clothes smeared with blood from carrying dying and wounded comrades. On Feb. 20, sickened by the carnage, he loaded his black Kia with propane cylinders without telling anyone. He drove to the base and rammed his car into the front gates, blowing them up. Hamed Salah, 20, was outside the base, protesting. If it weren't for Ziu, Salah says, the demonstrators would not have been able to take over the base: He sacrificed his life for them. Salah's brother, who was being held inside the base after being arrested by Gadhafi's elite forces, echoes the praise, saying he is sure he would have been killed if the base had not fallen. It proved to be the turning point in the battle for Benghazi. A few hours later, the base was overrun and the city was in the hands of pro-democracy forces. Ziu's wife, Samira, says she is proud of him. She has no son to carry his name — but such are the blessings of God, she says, that his name is now written in the history of this city. uploaded by mahdeozeo on 2 July 2011.
long distance shot of smoke rising , burnt out car, handful of bones. It is totally crazy. mahodeozeo also uploaded on the same day, 2 July, the CNN report by Reza Sayah who quotes the date 19 February for the blast, and interviews Jiu's friend Abdul Farhoud who collected Jiu's remains (i.e. the bones, I guess). he also interviews daughters Sajeda and Zahur. "What Al Mahdi did was pack his car full of plastic car fuel containers in cooking gas cylinders....then he sped towards the main gate where he blew himself and his car up..."
The other video you linked, the hilarious one, will have to be added here. I see no funeral procession, no great reason to film that way as the blast happens, but at last an alleged video of it. The bones make a lot more sense than pulling the friend out of the car, but could of course be anything. The car they show, not likely. Even that I doubt it would have an inside left to pull things from anymore. I mean, feet away from that, with diminished power, the blast wave knocked apart a steel-reinforced concrete structure. That car is like the radio manual cover in the PA103 bomb. Except... I bet five different cars have been called the one, none matching the one he owned. There is a video here of celebrations with commandeerd tanks in Benghazi, soldiers in uniform shooting, perhaps from TV, with title 20 February 2011 , uploaded by mbi3000 on 31 May. http://www.youtube.com/watch?v=mZsSd_caryY At 4.50 a large excavator punches a hole in the turreted wall of a military installation. My feeling is that there was a spot of "internal trouble" at the Katiba, and the barracks was liberated from inside. Where is this killing I wonder? And when? Re massive explosion, VivaAlgeria123New uploaded a video Libya : Combats à Ras Lanouf : Libye معارك عنيفة في رأس لانوف وبن جواد on 10 March showing a fortuitously witnessed massive explosion. Taken from Libya Al Youm TV, I think from the titles in the picture. A commenter has labelled it as an explosion at Benghazi muntions store, not Ras Lanuf. Who knows what it was. Al Jazeera also reported on an explosion in Benghazi on 5 March :قتلى وجرحى في إنفجار مخازن للذخيرة ببنغازي (Dead and wounded in the explosion of ammunition dumps in Benghazi),involving a suspicious car(translate) ..dozens of people dead, more than a thousand wounded many Asian workers in the وادي القطّارة district - Wadi Qattara, mostly civilians ,reporter Beppe Walid Ahmadi. More than ever I don't buy the Ziu story - reminds me of the grenades in the Khamis shed. Just another fable to re-write history quickly. But see street signs of Mahdi Ziu in Benghazi. 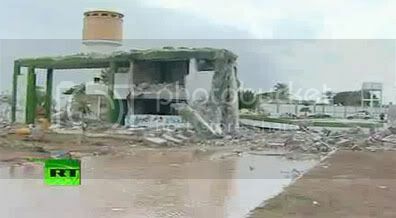 could a tank , suppose younis already arrived, make such a hole? Or could this be the work done by a mig? They were active with this in that period. On 17 February he joined protesters in front of the Court House and was very excited by this revolution, too. I saw the happiness in his eyes. He said, “I have never expected to see that our people could make a revolution”. He did not come back to our home except for lunch or he came very late at night, and then only to sleep. He used to phone us, telling us what was happening and how brave and determined the young men were. He prayed for the martyrs and went to the funerals. As our house is next to the military camp (katiba) we could see what was happening outside. My father was such a sensitive person that he could not stand to see somebody crying in front of him. So, when he saw so many young men dying, he was very affected because he was a patriot who was dedicated to his beloved country, Libya. He made a final decision because of his love towards his country. On the night of 19 February, he took us to my grandfather’s house because of the fierce shooting. On Sunday morning, 20 February, he came to us, drank coffee and talked about what had happened the night before. When he left, I had no idea what was in his mind. On the same day, at 2pm, we heard an explosion and saw black smoke far away, but it never crossed my mind that this explosion was made by my father. He entered the katiba from which snipers were killing and wounding the young men. He put two cylinders of cooking gas and bottles filled with petrol in his car and lay down in the driver’s seat so as not to be killed by snipers. He entered at high speed through the first door of the katiba, they shot at him with anti-aircraft guns and the car exploded in front of the second door. Benghazi fell to protesters on February 18. 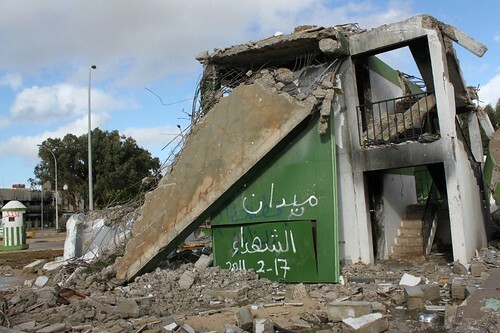 Two days later, demonstrators headed to the military compound to demolish the building they regarded as a symbol of Gaddafi’s authoritarian rule. JANA reported that the building had been pillaged by "rioters" but did not mention that the bodies of five burned soldiers had been found. On Sunday morning, 20 February, he came to us, drank coffee and talked about what had happened the night before. When he left, I had no idea what was in his mind. On the same day, at 2pm, we heard an explosion and saw black smoke far away, but it never crossed my mind that this explosion was made by my father. Gaddafi’s Katiba in Benghazi. The Supreme Guide’s garrison was totally demolished by locals.